Baked pimento cheese with bacon and cracker crumb topping (sometimes called Charleston Cheese Dip). So, you remember how I had 47 pounds of cheddar cheese the other day and I made Pimento Cheese? Well, after I made the pimento cheese I decided I wanted to use it to make baked pimento cheese (aka Charleston Cheese Dip) and serve it while we watched the game. Because that’s all baked pimento cheese is. It’s just your basic pimento cheese with some extra stuff thrown in for flavor and texture that’s baked. Cut bacon into 1/2 inch pieces then cook until crispy. Drain bacon on paper towels. Set aside. Shred cheese then add to a medium-sized mixing bowl. Add cooked bacon, pimentos, mayonnaise, salt, cayenne pepper and garlic then mix well until all ingredients are thoroughly incorporated. Fold in green onions. Spread cheese mixture evenly into a medium-sized shallow baking dish (I usually use an 8x10 oval dish). Sprinkle crushed crackers evenly on top of cheese then bake, uncovered, at 350 degrees for 20-25 minutes or until crackers are golden brown and cheese is bubbly. Serve with crackers and/or celery sticks. om gosh, this sounds amazing! 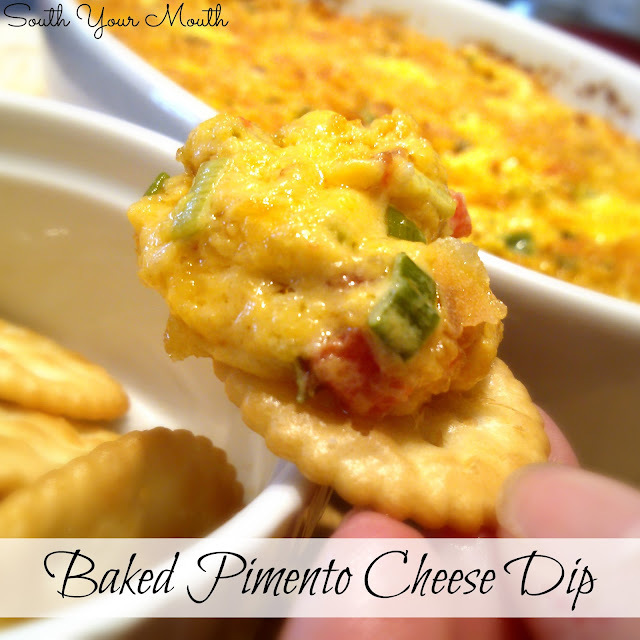 Im making this for the Cowboy game..
You know what else is great with anything "pimento cheesey"? Pretzels! Pretzel rods or pretzel crisps for dipping, yum! btw......love your blog, recipes and humor! Maybe it's because I live in the same area of SC too, but your page is just right up my alley! Keep up the good work! I loved this dip! Being from the east coast of Canada, I'd never had pimento cheese dip / sandwich. I tried this for an apps party this past weekend and it was a hit! I used good quality bacon from the Farmers Market, and it was just so simple and easy to make, it was definitely well received and will be made again. I love your blog! GAH! I didn't realize I left that out! Sorry! Bake at 350 degrees. It looks so delicious, I will try to make it. Thanks for sharing the recipe!